My sister-in-law out does herself every birthday party! She always has the cutest, most clever ideas! *Disclaimer: I don’t take credit for any of the hard work on this post, except for the picture taking and posting, I did nothing. It’s all her! Let’s start off with the cute decorations shall we? 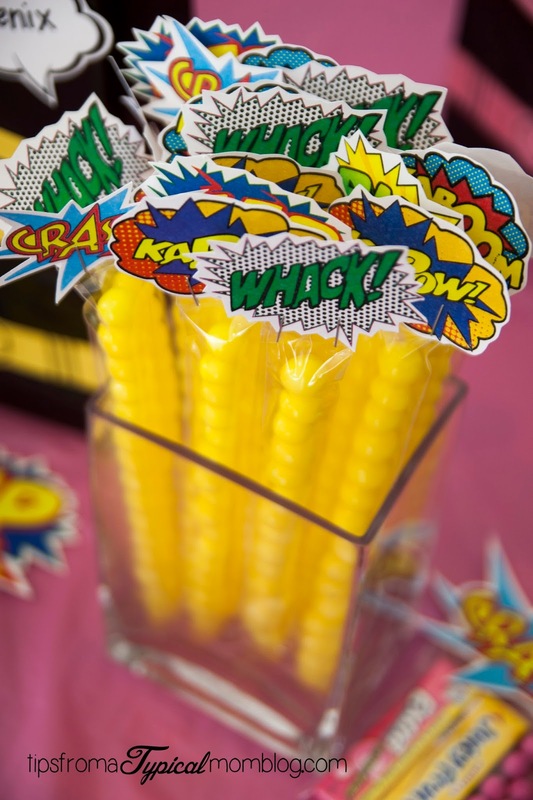 Here you’ll see the cutest candy favors ever. 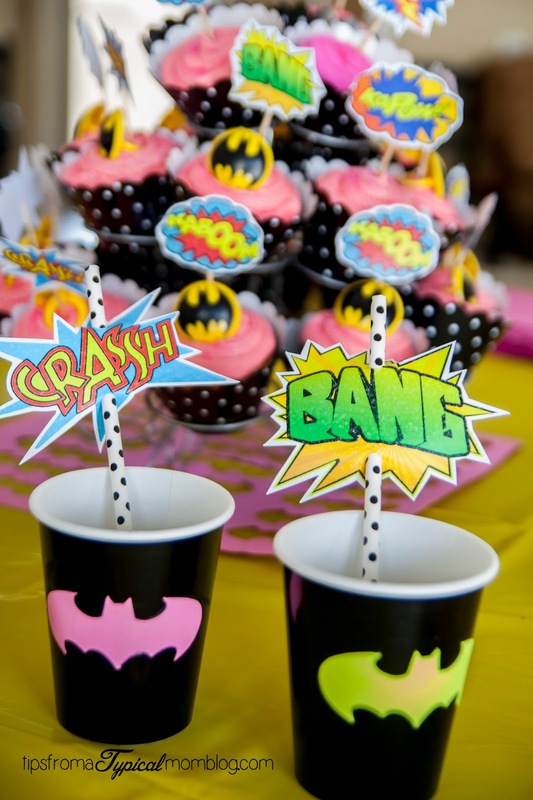 BTW, the cute cupcake toppers, candy toppers and photobooth props are free printables you can get HERE at Great Kids Birthday Parties website. Just print them in different sizes. 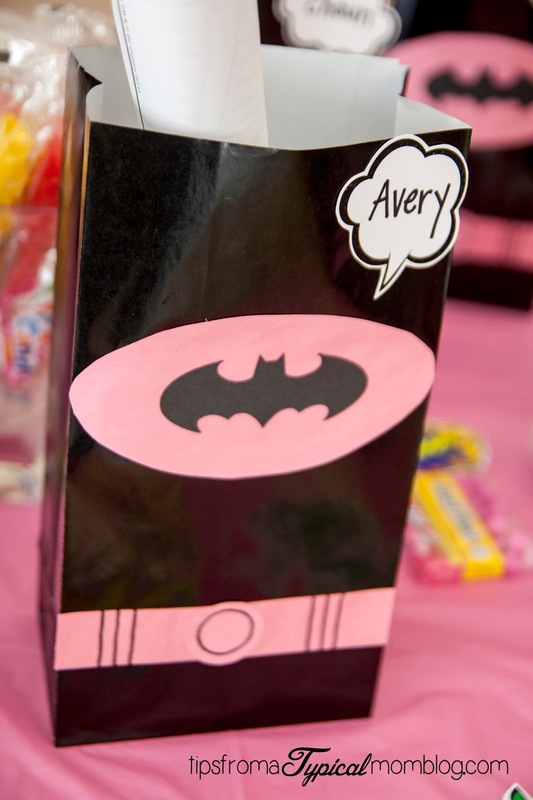 She had different sized candy bags to make these cute skinny, tall favors. 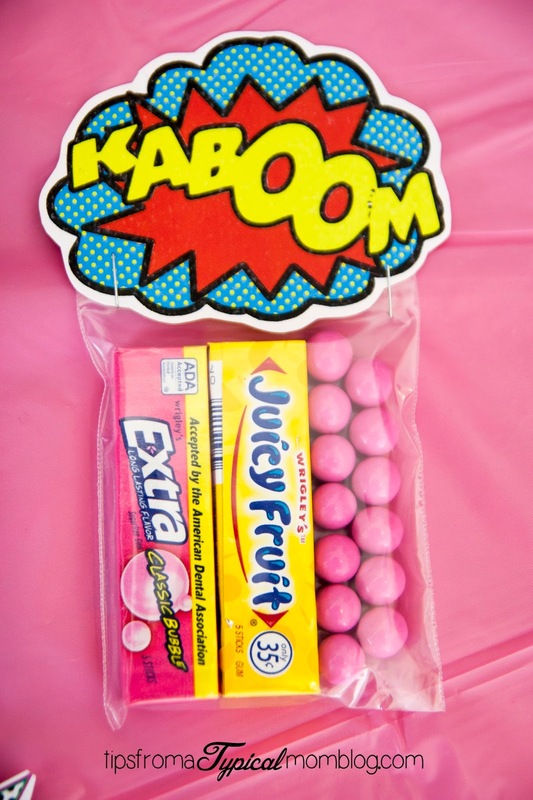 She filled them with lemon heads, pink Sixlets, and the short fat resealable bags carried the gum and Sixlets. 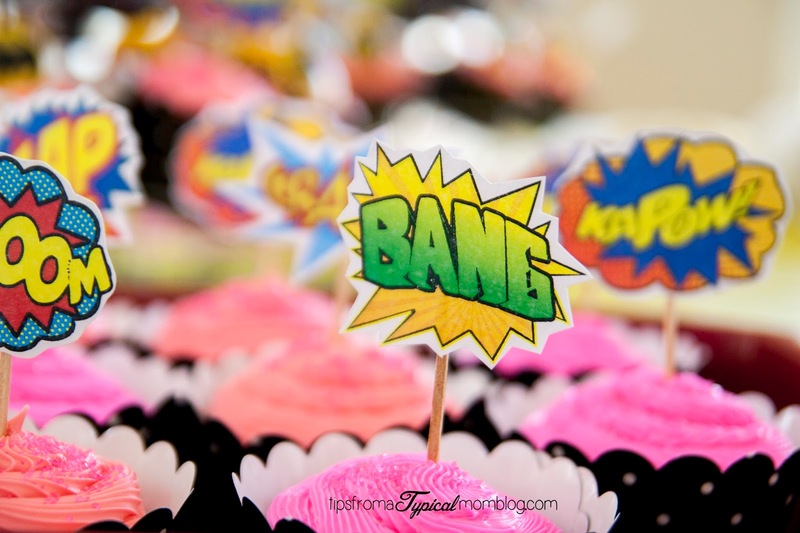 Next, she made cupcake toppers by taping them to toothpicks. A Bat Man ring makes a nice addition too! She used the same tags as straw decorations too. 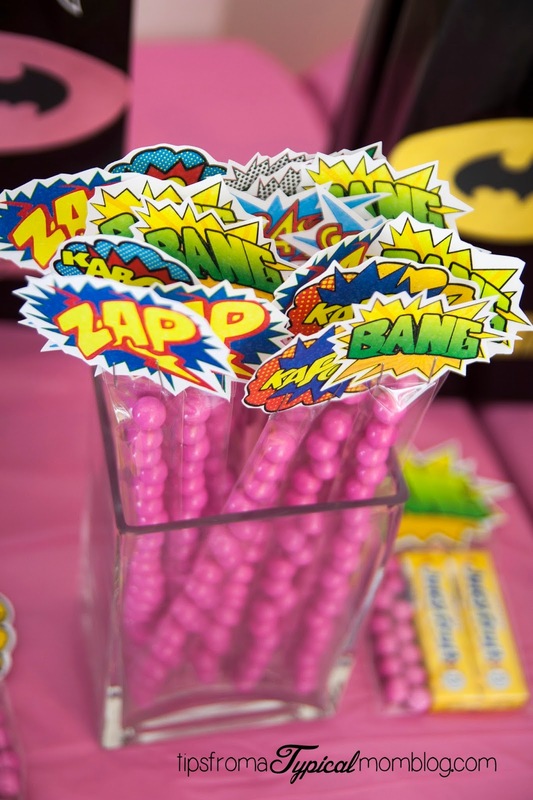 The straws were white with black dots and the cupcake wrappers were black with white dots. So fun! Looks just like a comic book print. 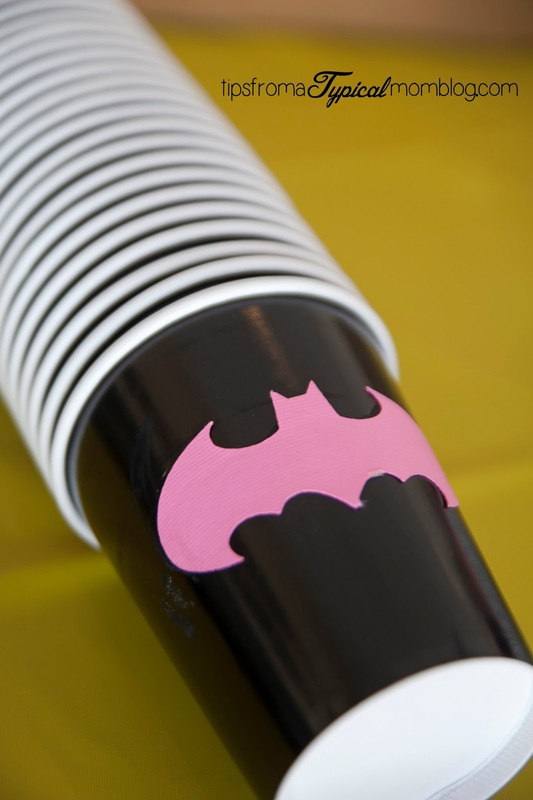 She has a friend who has a Silhouette cutting machine and she cut batman shapes out of pink and yellow card stock to be glued to the cups. If you don’t have a Silhouette, or a friend that does, you are taking too much time cutting things by hand. Head over there and check them out! They are amazing. Now, what to do with the negative cut out? Use it as a doily for under the cupcakes, of course! On to the next activity . . . the PHOTOBOOTH! What’s a party without one, right? 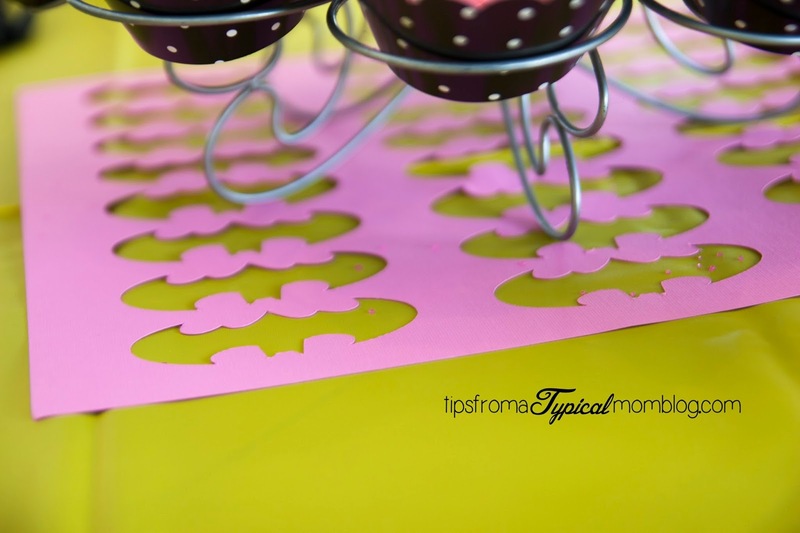 Using the same printables on a larger format, print, cut out and hot glue to small dowels for your props. 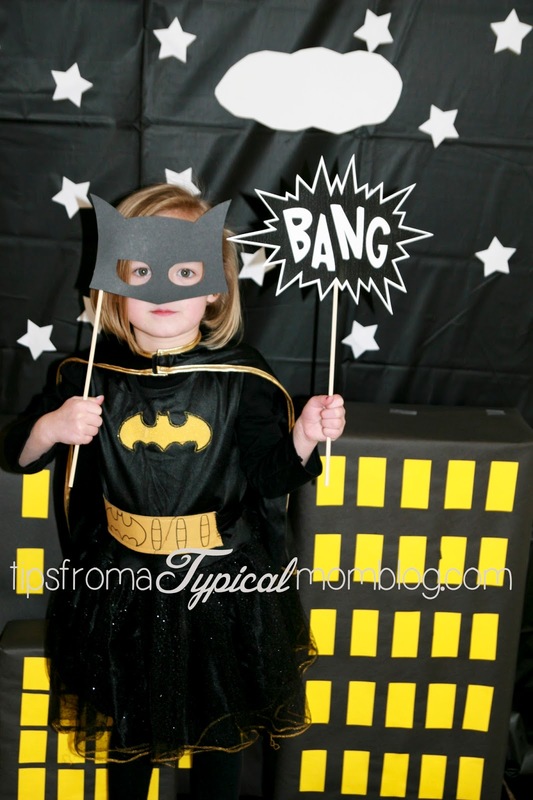 And of course we need a Bat Man mask, so Silhouette to the rescue again! 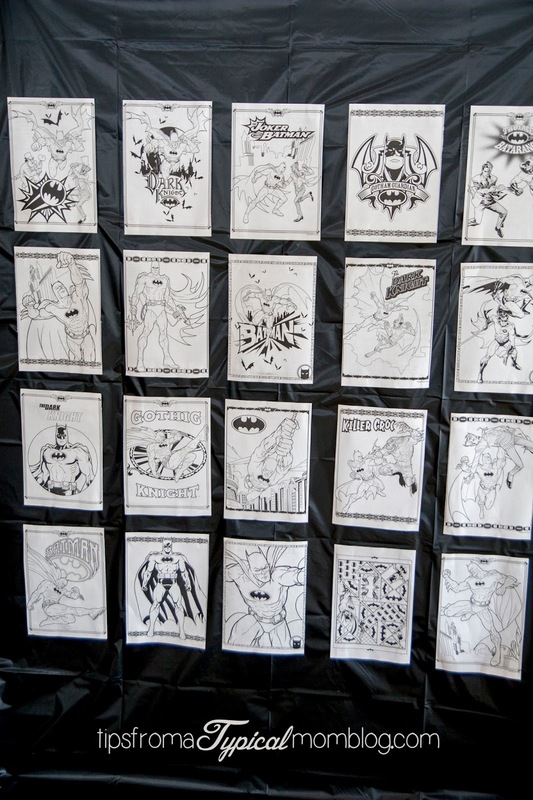 Or if you’re old school, you could cut it out yourself out of black cardstock. 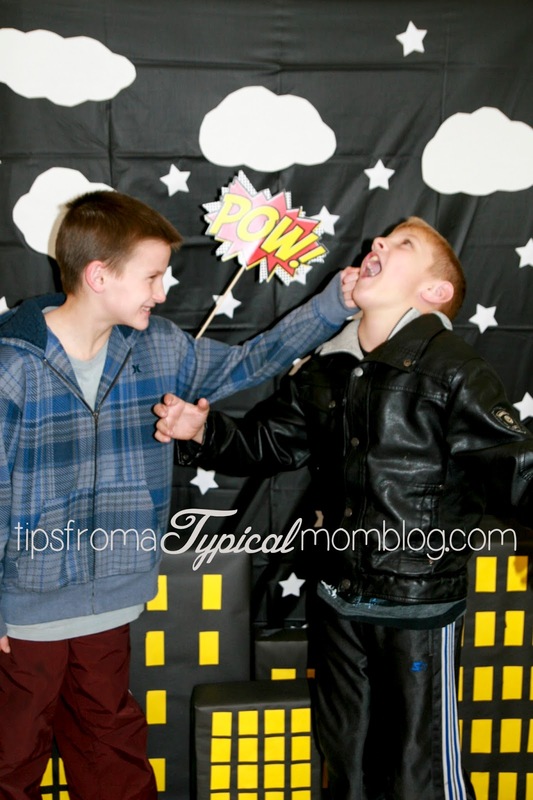 How brilliant are these backdrops? 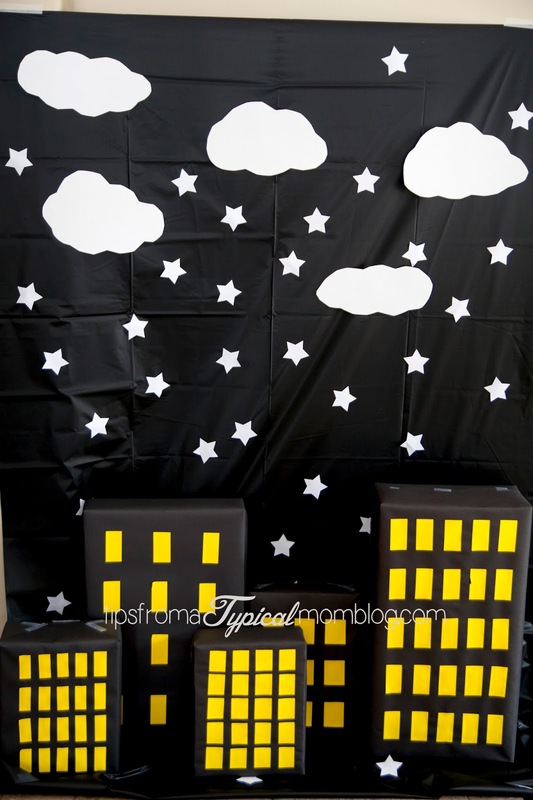 A cheap black plastic table cloth with stars (thanks Silhouette, again) and clouds taped on it with white card stock. 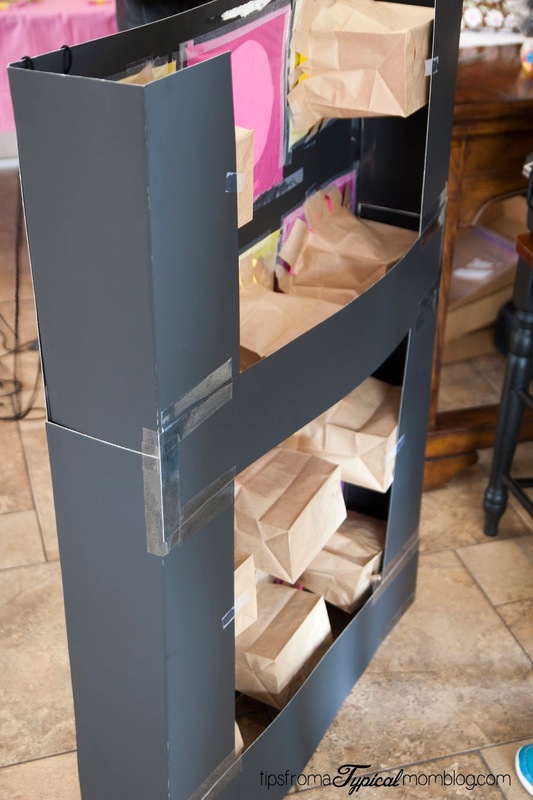 Then using different sized boxes, wrap with black paper and cut yellow rectangles for windows. 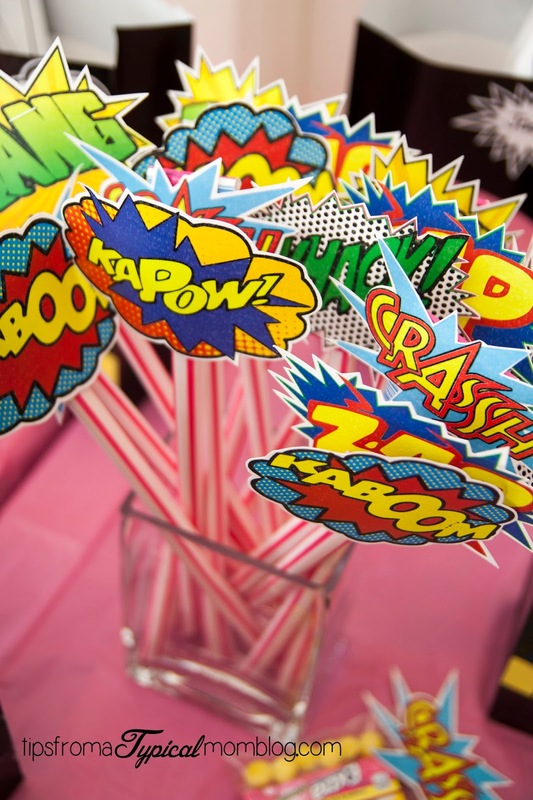 Another idea is to use a superhero coloring book and tape the pages to it for a backdrop for your photo booth. Here are some cute images we captured. Action shots are always the best! And the birthday girl makes her appearance! 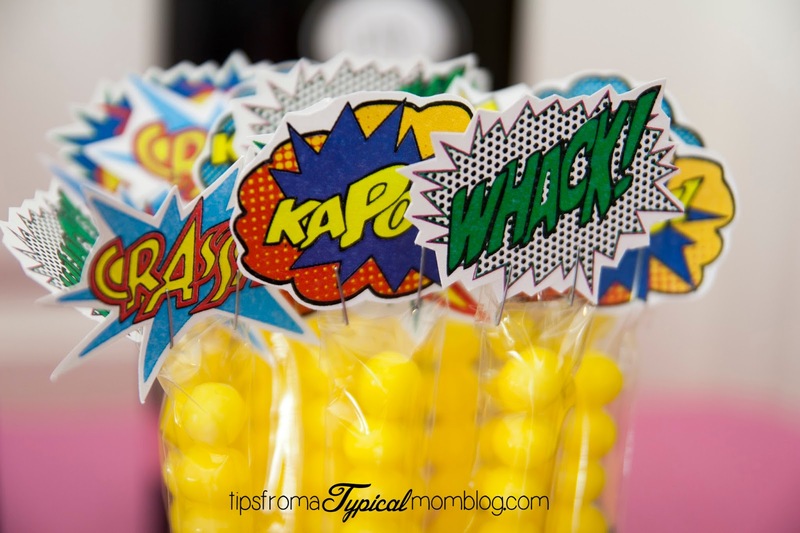 Have you seen the fun superhero sticker books? 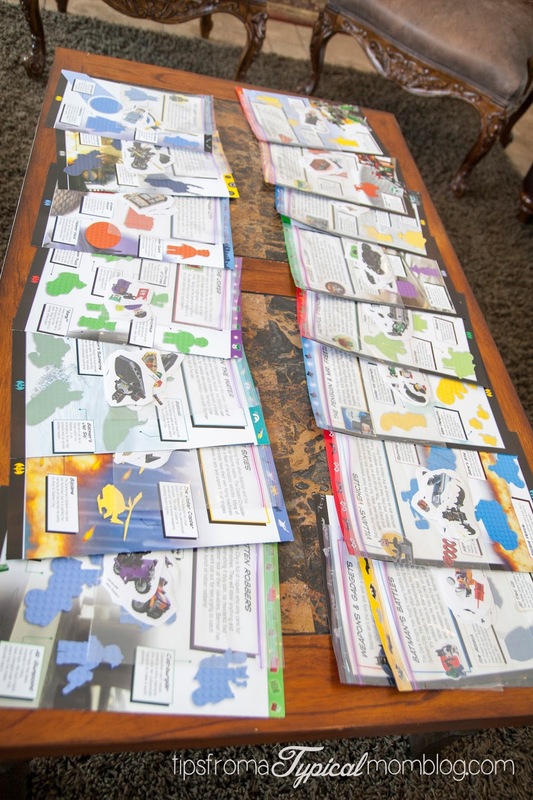 Why not cut out the pages and the stickers and make a little activity for the kids to do while they wait for everyone to arrive? She just placed the correct stickers with the corresponding page. Put the stickers in a sandwich bag and staple the bag to the page. Brilliant! 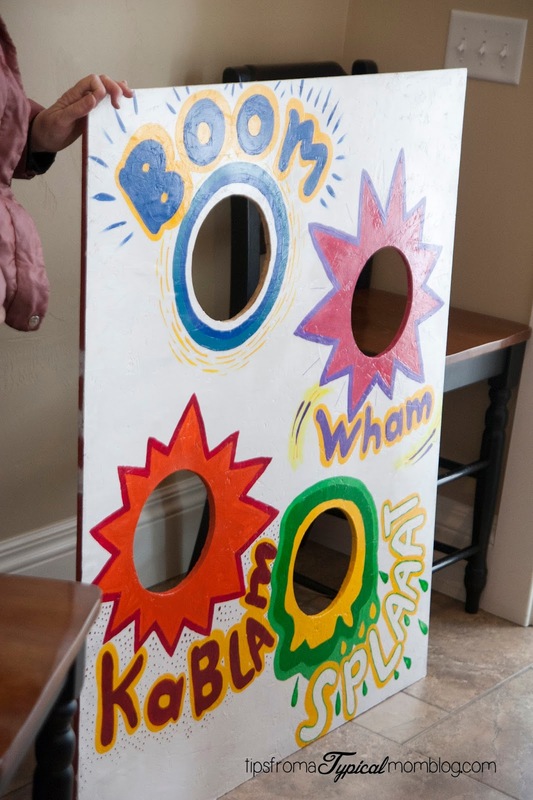 A fun bean bag toss was cut and painted by Nana with particle board. Hopefully you have someone handy around that can do something like this for you. If not, it could be easily made out of cardboard. It’s painted to match the fun printables. A punch the hole/ get a prize box was a hit with the kids. It’s very time consuming to make, but I think its worth it. 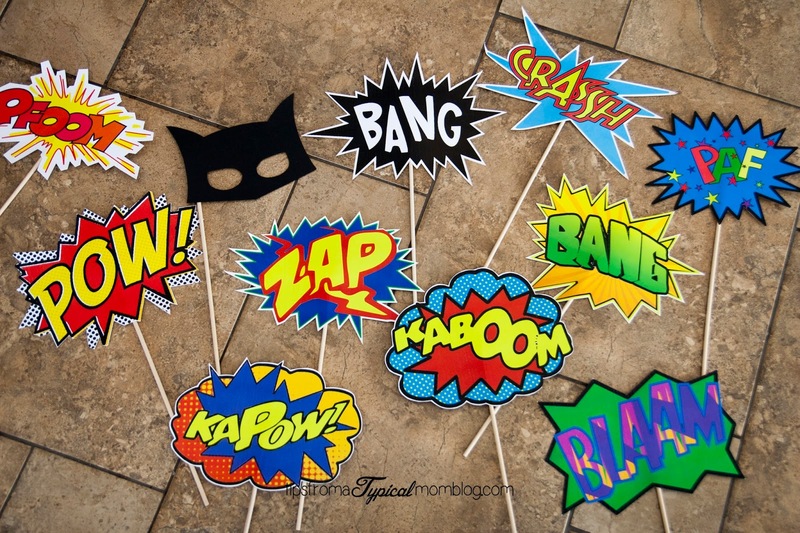 SO much better than a pinata in my opinion. I’m never a fan of swinging a bat around while being blindfolded in a crowded room. But that’s just me. 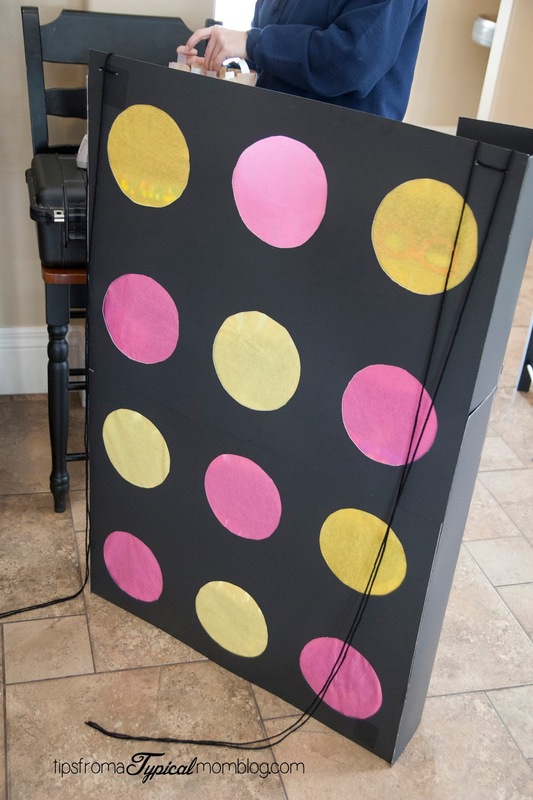 Learn how to make a Prize Punch Box Here. Now it’s time to sing Happy Birthday to the cute Bat Girl. 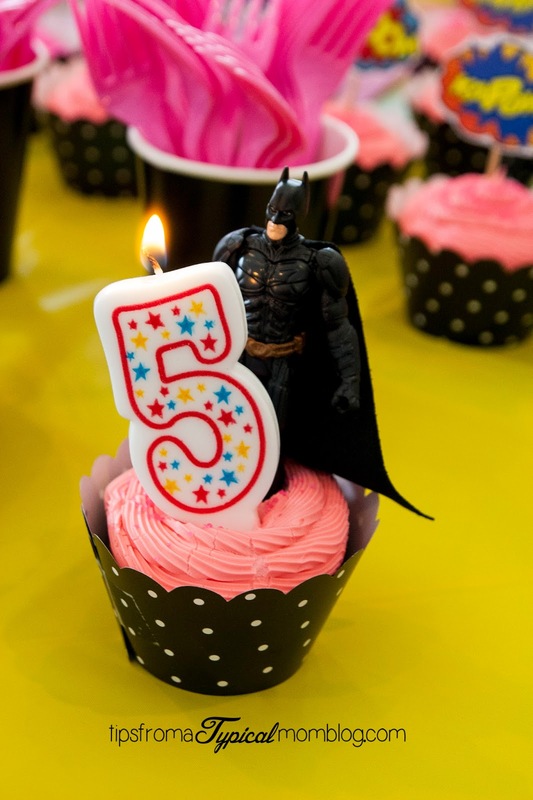 A Bat Man and number candle fit perfectly onto a cupcake, don’t you think? Now it’s time to go home and of course, everyone gets a goody bag. Pink for the girls and yellow for the boys. I thought the cute little speech bubble was perfect for writing their names on their bags. Can you tell my sis in law is a first grade teacher. No? Neither can I! What was inside the bags you ask? I adore this party. I love the colors. I love the activities. I love the free printables. I hope you can use some of the great ideas that were used. I’m not sure where she got the skinny bags :/ I asked her and she couldn’t remember. She just found them online, through Etsy.com I think. 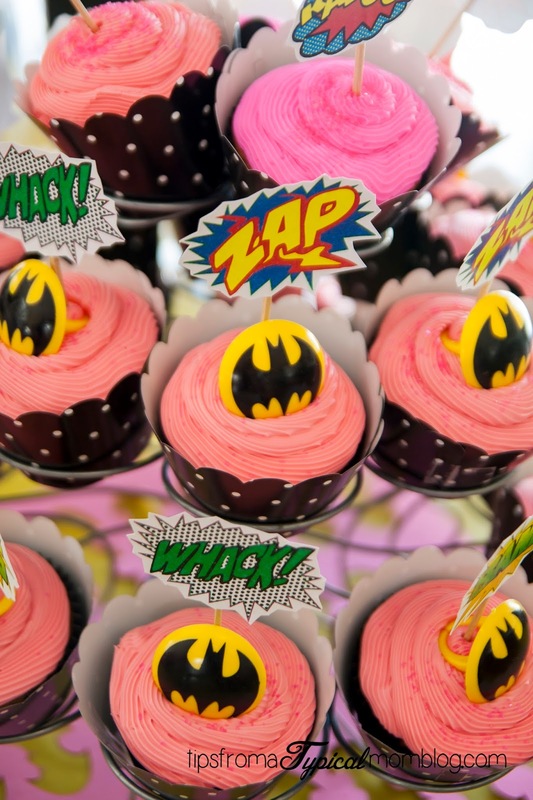 Also, any party store would have the cupcake wrappers, or even on the internet too! I find them at a local baking store. You can use pretzel stick bags from michaels for the skinny bags. Thanks for all these ideas. 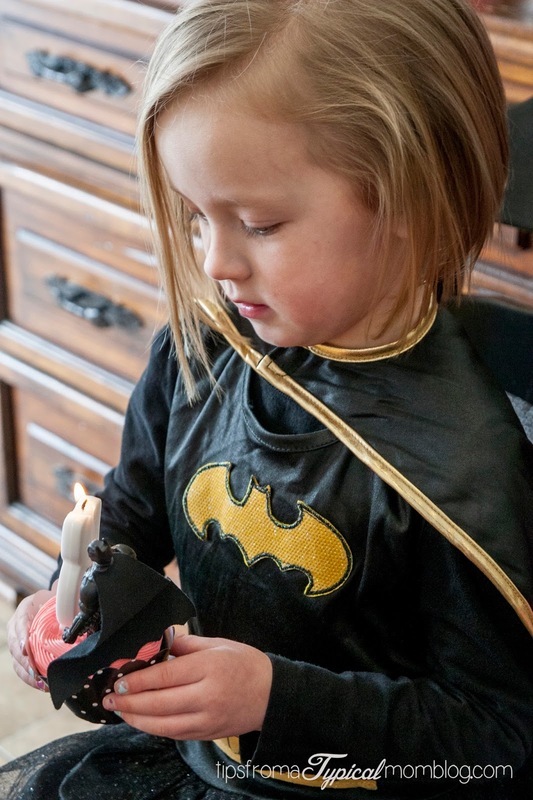 My daughters having a batgirl party this weekend. 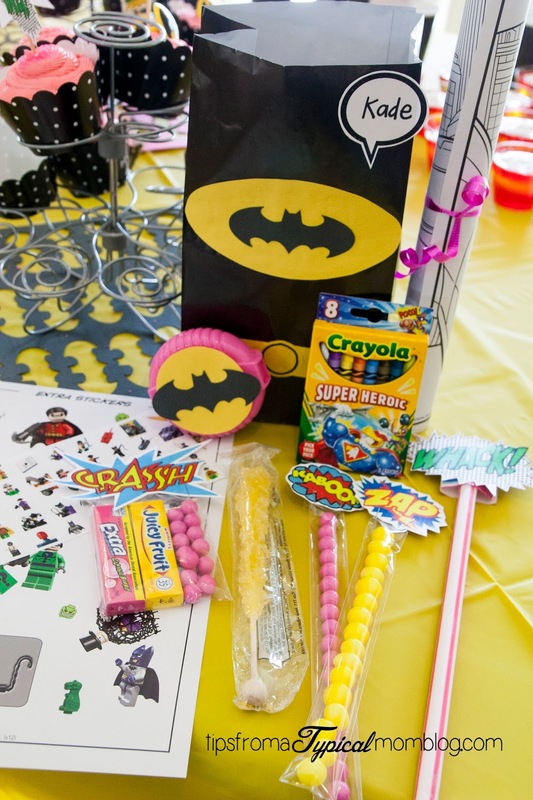 What a cute party.Thanks for sharing your ideas.My granddaughter loves batman. What are the red and white striped favors in the clear plastic sacks? They look like straws with a print out but you used polka dot straws? Cute ideas! Hi Sherry, do you mean the sugar straws? They are like Pixie Sticks, but much bigger. They are the only red and white favors she used. 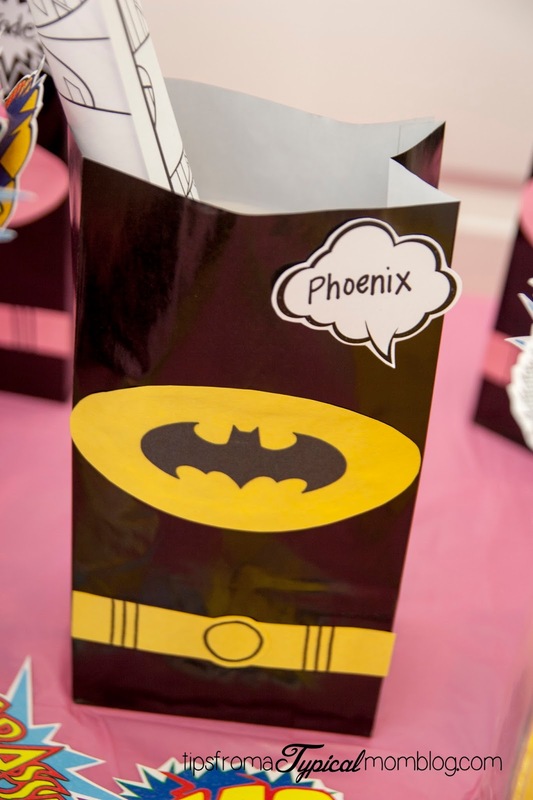 Where can I find the goodie bags?